Packed-up leftovers and stacked-up pantries are rarely the pride of the kitchen, but hiding them out of sight puts perishables precariously out of mind. A display-worthy set of design-smart containers is a decidedly fresher solution. While they have just one relatively simple function to fulfill, food storage containers can perform preposterously poorly. They leak, they crack, they let contents become stale and moldy, and they’re notoriously hard to clean. Still, being aware of potential shortcomings doesn’t always make it easier to know what you’re looking for in a new container, nor easier to judge its quality before trying it out. With concerns rising about the health risks of various plastics, glass has grown more popular. “I think you should store everything in glass,” says Grant Donnelly, who works in the vast bulk-foods department at Rainbow Grocery Cooperative in San Francisco. “Often plastic containers let air in, and the food spoils. Plus, glass looks pretty.” At home, Donnelly has his own mini bulk area, where he keeps everything in old-fashioned mason jars. Even back on dry land, nobody likes to see good food go to waste. With the right set of containers, stored goods not only last longer, they become display-worthy, with beans, grains, fruits, and snacks producing a palette more interesting than any paint-store purchase. Of course, no container can prevent abandoning leftovers in the back of the fridge. Frequent food forgetters, beware: A good container may fail to release the pungent reminders you depend on. Practical and elegant storage for everything from rice to sugar to jam. Airtight stoppes and lead free glass are perfect for foods, and come in 5 sizes. 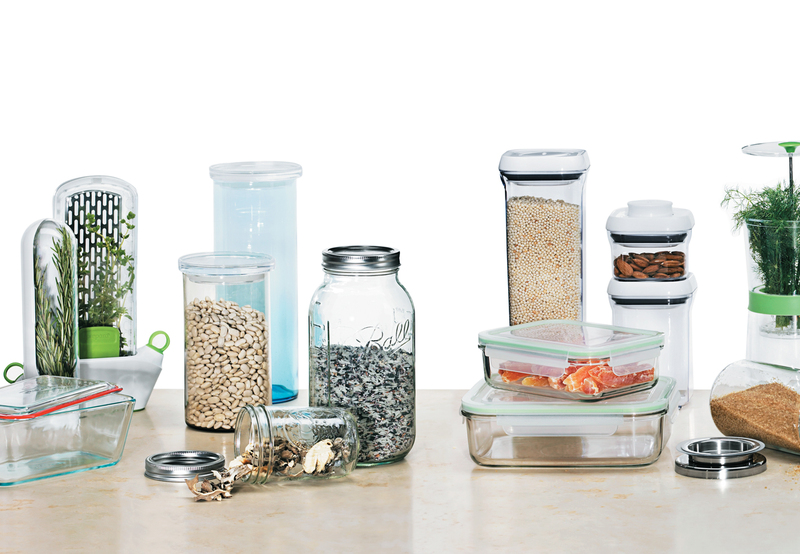 Simple glass storage for your leftovers. Square or circular tempered-glass in multiple sizes and very affordable price tag. Made in Italy, these glass jars have an easy open metal clamp and rubber gasket for an airtight seal. Available in half a dozen sizes they can store all your different leftovers. This large container keeps bulk herbs in a suspended removal tray. Floating above water your herbs stay fresh for weeks, right in your refridgerator door. These classic glass jars preserve frozen foods for an entire year, and are great for more than just storing foods - use them for gift-giving, cups, or organizing. Simple blue tinted or clear glass jar keeps your modern kitchen looking clean and tidy. Prepara brings us the herb-savor. This neat little container has a refillable water base, fits inside a typical refrierator door, and prolongs the life of your herbs for up to 3 weeks!